Burnley came from behind to beat Everton 2-1 at the Turf yesterday with second half goals from Ashley Barnes and substitute Chris Wood, and in doing so we completed a double over them for the first time in 58 seasons. Earlier in the season it almost seemed as if I was reporting win after win. That wasn’t strictly the case and it very definitely hasn’t been more recently with the wins, for a number of reasons, drying up. But today, for the first time since mid-December, I can report on a Burnley win and one that was fully deserved. This was the day a Sean Dyche side came from behind to win in the Premier League for the first time. Only twice have we achieved that in this league and both were during the short time when Brian Laws was manager. Everton led 1-0, against the odds, at half time but it was Ashley Barnes and substitute Chris Wood who got the goals that turned the game in our favour and not even visiting manager Sam Allardyce, who was beaten as a manager for the first ever time in a league game at Turf Moor, disagreed with the fairness of the result. The run without a win had taken a back seat in the days leading up to the game with the weather taking centre stage. It was as bad as it’s been in a number of years, but work was being done to ensure there should be no problems. By the time the game came around, the temperatures were still very low but the wind was nowhere near as bad and we hadn’t had any snow in over 24 hours. 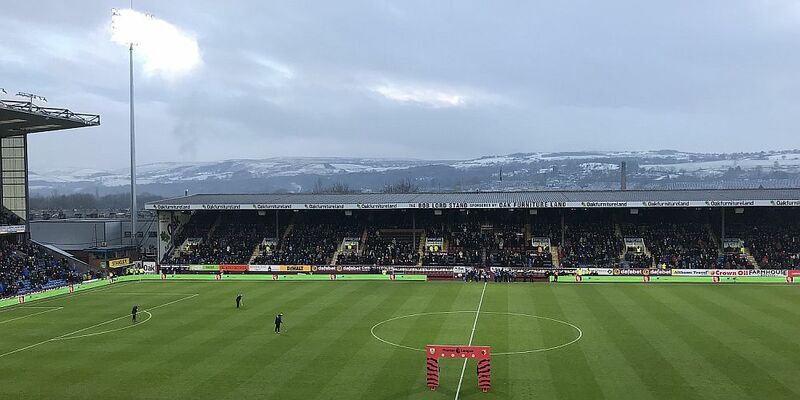 It was still very much the day to get the thermals on but the journey there for those some distance away was not as bad as feared and, with no home game to come for six weeks now, it was a relief to get it played. With no Park View and no fanzone, it was quiet outside the ground but inside we had another 20,000 plus crowd, albeit one smaller than for the Southampton game a week earlier as we made one change to the team with James Tarkowski coming straight back in alongside Ben Mee in the centre of defence. For former players, that meant a Burnley appearance for Aaron Lennon who was lining up against his old team who included former Burnley defender Michael Keane in their line up. By the time the final whistle blew, one had certainly got the upper hand in terms of personal and team performance. If I’d written my report of the first half during the half time break yesterday it might have read very differently than it does now. That, I think, was nothing more than being down to the frustration of seeing us a goal behind when, in truth, we should have been in front ourselves. Yes, Everton might have had an opportunity or two, but we’d been the better of the two sides by some distance. We had our chances too and you would have to say that our visitors had to be thankful for the goalkeeping of Jordan Pickford as much as anything. Everton had the first chance of the game that Theo Walcott blazed over and their goal was scored by Cenk Tosun who headed home a ball flicked on by Seamus Coleman who is part of the Everton squad again having recovered from the shocking injury he sustained playing for the Republic of Ireland against Wales. For Tosun, it was a first goal in English football. Our chances seemed to fall, in the main, to Barnes. At the time I thought he should have got onto a low cross from Jόhann Berg Guðmundsson. It was only when I saw it back that I realised Pickford had got the all important touch to take it away from the Burnley striker. Barnes then didn’t quite get onto a ball played through to him and missed out on the chance of getting a shot in and finally he saw a superb header tipped away by Pickford for a corner. Ben Mee had a chance from close range whilst all of Jack Cork, Ashley Westwood and Guðmundsson had shooting opportunities. It really was frustrating. I don’t think we’ve played particularly badly throughout this run when a lot of circumstances have worked against us, but we’d played well here in the first half yet still trailed at the interval and, as I’m so often told, you know what that means for Burnley in this league. Not one player had really disappointed in the first half, but Dyche decided to change things in the second half. Wood came on for Jeff Hendrick. He’d played well in the first half but was sacrificed ‘purely for tactical reasons’ the manager said to allow us to get two players up front with Wood to partner Barnes. Poor Keane had struggled to cope with Barnes in the first half. Now, alongside the totally ineffective Ashley Williams, he was facing a double dose with Wood on the pitch, and how those two gave the Everton defenders a nightmare half. We were at them straight from the off and Pickford was again in the action saving from his ex-team mate Lennon and then doing well to keep out a Mee header from the resulting corner after which Wood headed over. But the goal finally came eleven minutes into the half and so much credit must go to two of our back four. It all started when Pickford cleared the ball. Two players went up for it but the ball was moving towards the Everton technical area and Tarkowski spotted potential danger from the centre circle. He moved across, got to the ball, superbly beat an Everton player in a tight space and played the ball forward almost along the line to Matt Lowton. Did I say Matt Lowton. Let’s go with Matthew de Lowton because had his pass come from the boot of Kevin de Bruyne it would probably have been under review on Sky for the remainder of the weekend. It was brilliant, it was inch perfect. It dissected Keane and Williams for Barnes to run on to. He took it to the six yard box before beating Pickford on his near post and Burnley were level. For some time it was all Burnley and it remained like that but, during this period, Everton had introduced Wayne Rooney as a substitute. When he came on in the fixture at Goodison he gave them some impetus and eventually I thought he was having an influence here. We’d not been under any threat but with around 12 minutes to go they had their one chance of the half when Gylfi Sigurdsson picked up a Stephen Ward header in the box, got round Lowton and fired just wide of goal. I thought he was going to be a certain scorer but, had it been just inside the post, Mee had got back and would probably have cleared. Within a couple of minutes we’d won it. From the resulting goal kick we got the ball up the pitch and Lennon won it back from the Everton defenders, played a one-two with Barnes and won a corner on the right. When that corner was headed out it dropped for Lennon whose shot deflected off Rooney for a corner, this time on the left. Guðmundsson had taken the first and moved across to take the second one. I’m not really too fussed what Pickford was doing, or Williams for that matter. But I was delighted when Wood got up virtually unmarked at the far post to head home. Surely we’d won it. Everton hardly threatened and when they did it went even worse for them. They won a free kick on the left and as the ball came into the box, referee Chris Kavanagh blew and immediately showed Williams a red card. He’d probably just about had enough and swung his arm at Barnes. The one sensible action for the former Swansea defender was to walk off without protest. As we moved into stoppage time, focus was on the two managers. I can’t recall seeing Dyche so animated on the touchline. I thought he said he was injured? He was moving well enough to have got himself a game. Allardyce, meanwhile, was the subject of some abuse from the cricket field stand. I don’t think the Everton fans like him. That was it. The wait was over. We’d won 2-1. We’d got to 40 points and that’s like the old days with 50 in the Football League, when Stan Ternent used to tell us it was time to crack on. We’ve done it with nine games to go and that really is some achievement. We also had 21 shots at goal yesterday and, I thought, we played well throughout. It’s really great to be winning again and, as has been reported, it was a first double against Everton for quite some time. The last time was in August and September 1959 when we beat them twice in eight days. We were early leaders in the league after the home win took us to two wins in the first two games of the season. We won 5-2 that night with goals John Connelly(2), Brian Pilkington, Ray Pointer and Jimmy Robson. In the following midweek we won 2-1 at Goodison with Pointer getting them both. It’s also worth noting that Everton are only the second team we’ve beaten four times in the Premier League era, the other being Hull, and the first team we’ve recorded three home games against. Back to this season as a whole; we’ve got to that magical 40 points seven games earlier than last season, now we really do need to push on, get a Burnley best in the Premier League and see how far we can go. For those whose glasses are half empty; we will be playing Premier League football next season and bring it on if we can have some more performances like that. Embed from Getty ImagesIt’s difficult to single players out. I thought Tarkowski was excellent at the back, Westwood was so assured in midfield, Lennon looked as good as we’ve seen him so far and I bet Keane and Williams have gone into hiding today after having to deal with Barnes for ninety minutes. That’s it for six weeks now at home. Hopefully by then the snow will have cleared, it will be warmer and we’ll have even more points on the board. Burnley: Nick Pope, Matt Lowton, James Tarkowski, Ben Mee, Stephen Ward, Jόhann Berg Guðmundsson, Ashley Westwood, Jack Cork, Aaron Lennon, Jeff Hendrick (Chris Wood ht), Ashley Barnes. Subs not used: Anders Lindegaard, Phil Bardsley, Kevin Long, Dean Marney, Georges-Kévin NKoudou, Sam Vokes. Everton: Jordan Pickford, Seamus Coleman, Ashley Williams, Michael Keane, Martina, Theo Walcott, Tom Davies (Wayne Rooney 59), Idrissa Gueye, Dominic Calvert-Lewin, Gylfi Sigurdsson (Yannick Bolasie 83), Cenk Tosun (Oumar Niasse 68). Subs not used: Joel Robles, Mason Holgate, Leighton Baines, Morgan Schneiderlin. Attendance: 20,802 (including 2,458 from Everton). It’s almost appropriate that, given the weather conditions this week, our thoughts should turn to Canada where they get more than their fair share of snow. In particular our thoughts turn to our friend Steve who posts on the message board as ClaretCanada. Steve recently received the devastating news that he was suffering from cancer and that he didn’t have long left with us. He’s been a big supporter and friend of Up the Clarets and also of our fundraising over the years through the youth foundation. He’s now receiving palliative care and I know he’s in the thoughts of everyone on the message board. I was waiting for Burnley to win before writing this and would like to dedicate this report from this victory to him with the love of all his friends here at Up the Clarets.